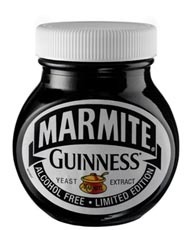 In time for St. Patrick’s Day, Guinness yeast extract will be used to make a special spread, limited to 300,000 jars. It’s available today 19 February 2007 for around £2.49 from supermarkets in the UK. While that is strange, it kind of makes sense – Marmite and Vegemite both use the left-over yeast from the brewing process. What is really strange is a new Japanese “innovation” in the brewing technology – Milk Beer! Reuters[^] have an article about a Japanese liquor-shop owner who is now making beer from milk – called “Bilk”. Apparently public interest in the 30% Milk brew has resulted in it selling-out. Since there is milk in there, does that mean that it’s good for you?